Chiropractic works with this innate healing power, your Innate Intelligence, to help you recover quickly from injuries and enjoy the quality lifestyle you deserve throughout your life. How does this happen? 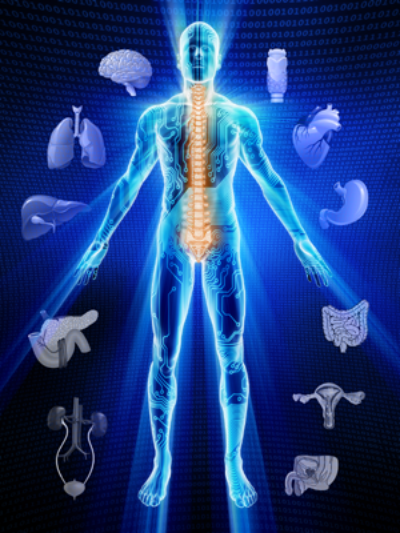 Your nervous system is the master control system of your body and healing energy flows over this network. With over 45 miles of nerves delivering over 3 million messages per second between your brain and every one of your cells, this pathway between your brain and body must be healthy for you to function properly. This pathway must also be clear for you to heal if you have been injured or you are sick. Lifestyle Interference results from poor health habits such as overeating, poor nutrition, excessive drinking, taking prescription or non-prescription drugs, or sitting too much. Environmental Interference can be caused by toxicity from air, food, water, or chemicals, as well as accidents or natural disasters. Any type of interference can cause pressure in your spine and nervous system and affect your health on every level. Rather than releasing the healing power within them, too many people treat their symptoms with over the counter and prescription drugs while the underlying cause, the interference, remains in their system and accumulates damage for decades. This has short and long term consequences. The great thing is that as long as you are alive and breathing, and there is life flowing over your nervous system, this healing power stays within you, just waiting for you to get the interference out of the way. When you do, it goes to work and does its job! With consistency, not only can your body heal to the point where you feel better, your health can stabilize and your body can also regenerate. How many weeks have you or your loved ones spent where you are waiting, hoping and praying for health problems to go away? Everyone deserves to be healthy and express their full potential from the time they are born through their last breath of life. This includes you. Release the healing power within you and enjoy the quality of life you want for a lifetime. Copyright 2013. The Family Practice, Inc., Dr. Eric Plasker and The 100 Year Lifestyle. All Rights Reserved.